To learn about the improvements in practice, I extended the upper part of a 2.8m prime focus dish. The performance was quite good, so I presented this project and its results at the 2012 EME conference in Cambridge. But in fact this was more or less a startup project, as I was already thinking about building a larger offset dish. Of course blocking by the feed has less influence the larger the dish is, but the advantage of less spillover noise pickup by the feed is still present. A large dish also has the convenience of an easy access, as you have the feed close to the ground. A prime focus dish is relatively easy to build. You only need one simple formula, choose the diameter and the f/D ratio, and you can calculate the dimensions of the ribs, which all have the same shape. The story is completely different with the offset dish. 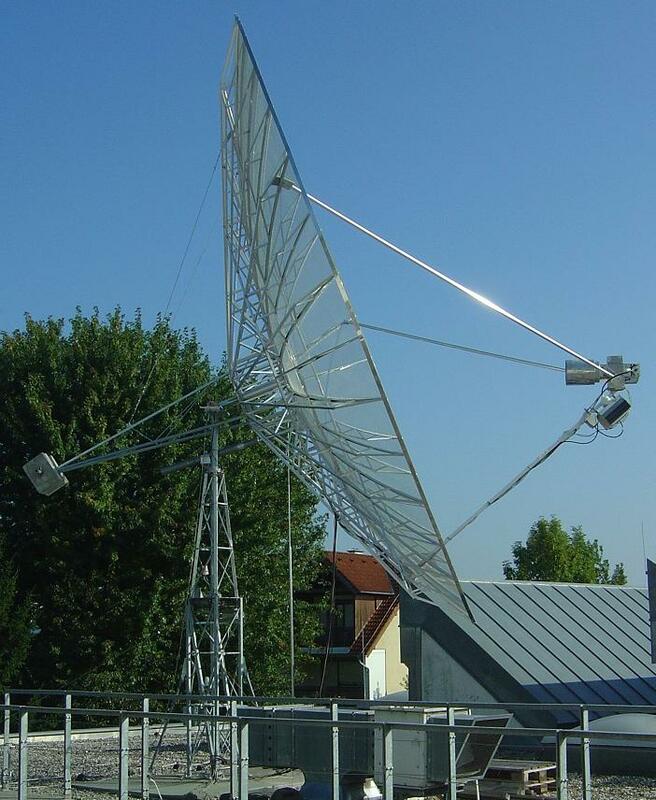 As the mechanical center of the dish is now outside the vertex, the curvature and the length of the ribs are different. Only right and left side are identical, which results in pairs of ribs of the same shape. The instrumentation and visualization software Labview is not the very best for calculating the ribs for a dish, but I am somewhat used to it and it contains all the mathematical functions needed for this project. The results of the calculations seemed reasonable, but to be honest, I did not totally trust my own formulas. Therefore I decided to build a model, covered the surface with aluminium kitchen foil and placed a small strong LED at the focus. I could observe a nice light spot at the wall in the predicted direction. 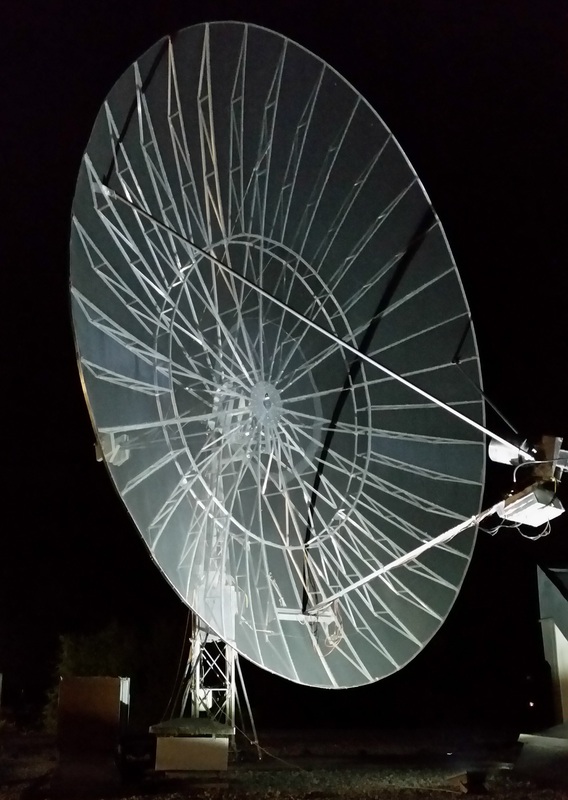 Later I simulated the offset dish including the feed with NEC to have an additional confirmation. The main lobe and also the gain from the simulation fit my expectations. Conventinal prime focus dish designs usually have the mechanical center (hub for fixing the ribs) at the vertex of the paraboloid. With my program 'Ofs_calc_jfl' I can choose the focal length, the depth of the dish, and then shift the mechanical center upwards to achieve an offset dish. The program provides the rib dimensions as a chart. Steps from a prime focus dish to an offset dish. Input and output parameters of the program. If the focus at 0 deg elevation is not higher than the lowest point of the rim, it is a true offset ( 'focus to rim' < = 0 ). In the case of ( 0 < 'focus to rim' < diameter/2 ) the dish is more or less offset, which you can consider as a hybrid. I suggest to change the parameters 'focal length', 'depth max' and 'shift center' step by step, until you achieve the diameter and f/D of the dish of your choice. The number of ribs is of course your decision. The parameter 'depth mid' should be around 25% of 'depth max', which will result in the middle rim having around half of the dimensions of the outer rim. The parameter 'focus to rim' tells you the distance between the lowest part of the dish and the focal point. Furthermore, the program calculates the coordinates of the focus and the vertex in respect to the mechanical center. This is important to know, as the line between the vertex and the focus is the direction of radiation. The shape of the outer rim is elliptical. 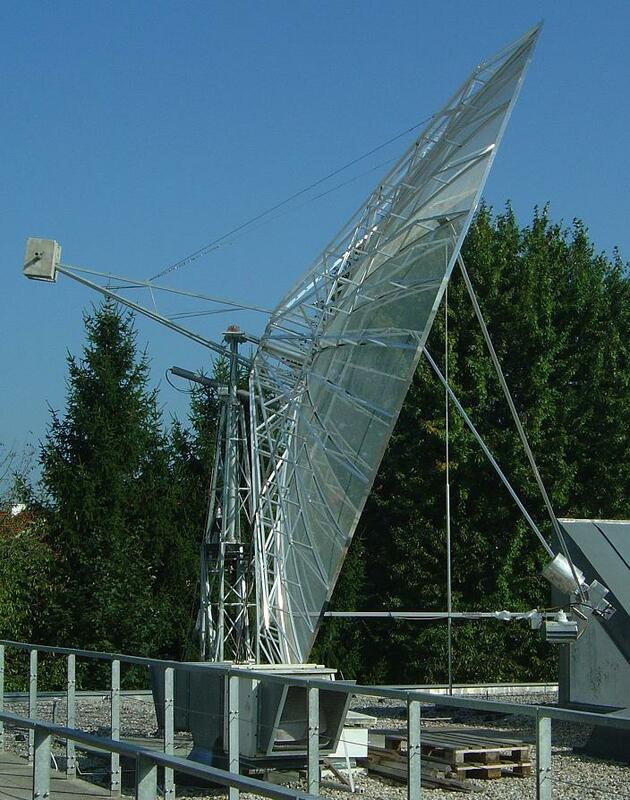 The long axis streching from the top of the reflector to the bottom, and the short axis is corresponding to the dish diameter. Looking frontally into the dish at 0 deg elevation, you see an exact circle due to the tilted ellipse. The feed must be tilted upwards and should be directed towards the mechanical center for best efficiency. The ribs are arranged around the mechanical center in equidistant angles. The program's output is a chart containing the rib dimensions you need. The right way to use the chart is explained below on the example of the rib at 60 deg. The rib at -60 deg (=300deg) has the same shape. The rib at 10 deg is the same as at 350 deg e.t.c. Only the ribs at 0 deg (top) and 180 deg (bottom) are unique. The top line at the chart below shows the angle (0=top), in the column on the very right the radius values can be read out. The last value of the other columns represents the radius of the tip (lower yellow mark), the value above shows the radius of the middle ring (lower blue mark).The rib at 60 deg is marked in red, together with the radius column. The example chart above shows a dish with 2.4m focal length, the center is shifted to 1.6m above the vertex and the dish is 0.8m deep. This results in 5.69 m diameter, a long axis of 6m and an effective f/D ratio 0.457. The longest rib (to top) is 3.266m long, the shortest 2.731m at 150 deg. The yellow mark at the very top means the maximum depth of the dish, the blue mark at the left side de depth at the middle ring. The figure below shows the form of the rib for the 60 deg position with 2.996 m length and the inner ring at 1.471m. The depth at 1m radius is 94mm and the depth at 2m radius 365mm. My dish has 36 ribs (18 full length, 18 half length), which means 19 different sizes and shapes. Of course, changing the rib template this often during building resulted in a lot of work. But those extra hours finally accounted for less than 5% of the time I spent for realizing the whole project. 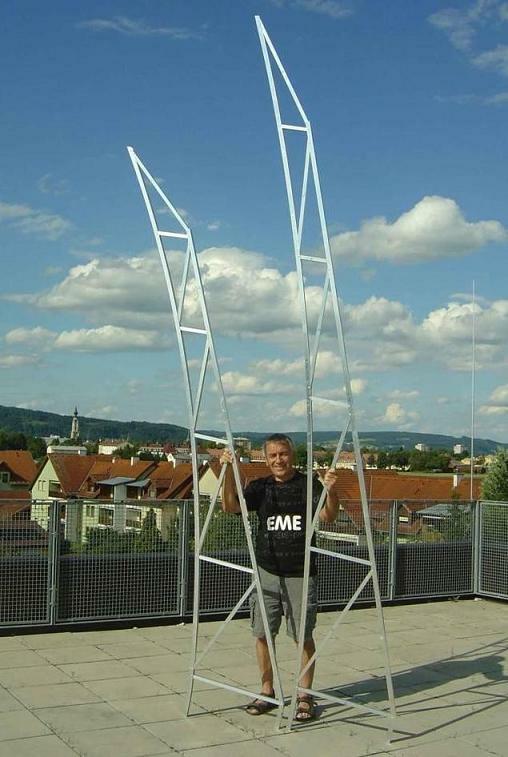 The tower construction has to be somewhat special as well to allow the reflector to be tilted downwards. This is not a big problem, as the tilting angle in my case is 20 deg. With a true offset dish it would have been 30 deg and the feed would have been scratching the ground. For an easy access during assembling and (hopefully not necessary!) for repairs, it is a foldover construction. I can pull up the whole reflector on the mast by a cable winch. The dish is equipped with the same RA3AQ feed horn I used for my former 5m prime focus dish. For the first measurements on 23cm I also had the same preamplifier. The 7.3m offset dish with a slightly lower f/D has 3dB more gain compared to the 5m prime focus dish. Sun noise has been 15.5 dB with the 5m dish at SFI 65. 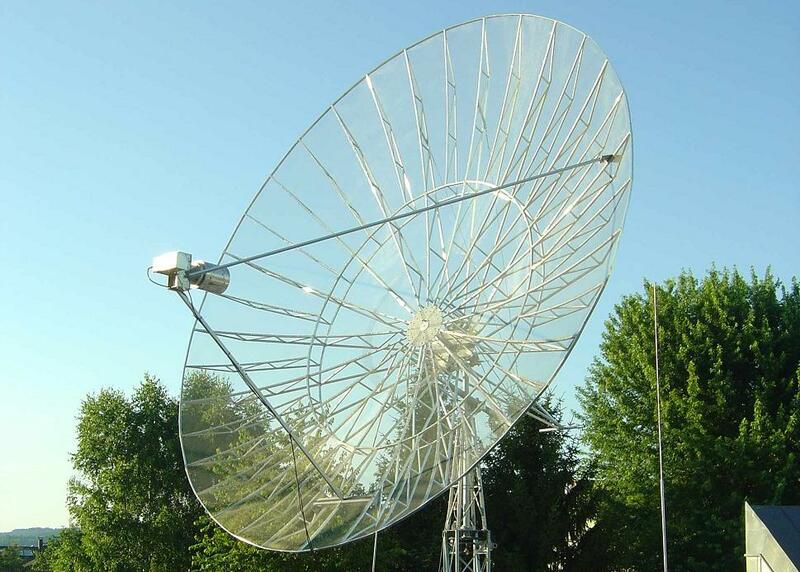 With the 7.3m dish I got 21.5dB at SFI 104. Considering 3dB more gain and 2dB more SFI sun noise should have been 20.5dB, so I received 1dB more than with a prime focus dish. This is a quite good coincidence, which I had estimated before based on less ground noise. The equipment beside the antenna consists of a FT817ND transceiver, Kuhne transverter 28MHz to 1296 MHz, LDMOS driver stage and PA (2x PE1RKI) up at the antenna. For controlling the antenna I use a stand-alone ( without PC ) microcontroller based system of own design.